In just a few years Wales, especially South Wales, went from a largely rural economy to a massive industrial one, mostly based on smelting and related processes. Copper and tin, then iron and steel, chemical works, refineries, and rolling mills. Smelting requires many tons of coal to smelt one ton of ore. Industrialists realised that it was cheaper to import the many different ores to where the coal was, than to export the coal to where the ore was. And there was lots of coal in Wales. When war prevented the import of iron, investors realised that all the raw materials needed to produce iron were in the same place: Wales had iron ore, limestone, coal and wood. Initially ores came from Britain, but when those supplies began to run out, ore was shipped to Wales from all over the world, including Australia and South America. There were iron works at Merthyr Tydfil and elsewhere in the South Wales valleys producing almost half of Britain's iron exports by 1820. 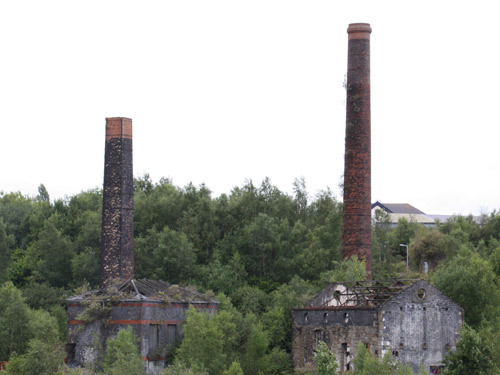 Swansea became known as 'Copperopolis' because of the area's central position in the production of copper. By the 1860s the copper mines on Anglesey employed over one thousand men, and the slate quarries in Blaenau Ffestiniog and Llanberis were the envy of the world. Later Llanelli became known as 'Tinopolis' because of the proliferation of tinplate works. But Wales is best known for coal. It was originally used mostly for industry, until the 1830s when it began to be used as domestic fuel. Then came steam ships and railway trains. As coal became more in demand, coal mining became an industry in its own right, instead of just a part of the smelting process for copper and iron. As the industry exploded, more and more men were needed, who flooded into Wales, and the population exploded along with it. Less than 1,000 people lived in the Rhondda valleys in South Wales before 1850. By 1910 there were over 150,000. People came from far and wide to make new lives for themselves, changing the composition of the population for ever. Fortunes were made by those who invested in the boom, and the economy was revolutionised. But there is another side to the story, which we will look at next week. Breaking News - See the Kestrel!